"This is a good way to use up lemon rind and it goes good with coffee or on cake. It really does taste like candy, and you can do this to ANY citrus fruit. If you use oranges you can add brandy, cloves or other spices the mixture. Chop it up and put it in cookies, or just eat it by itself." Bring water and lemon peel to a boil in a small pan. Drain water, and repeat with fresh cold water. Repeat the boiling step three times (see Editor's Note). Drain and set peels aside. 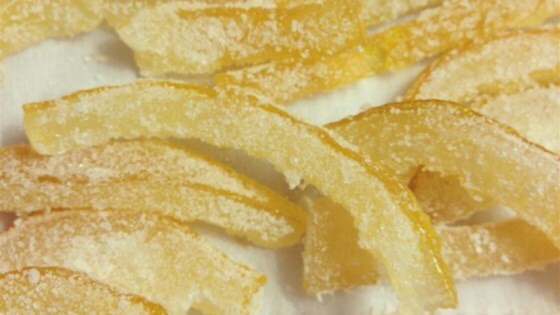 If you use grapefruit peel, change the water and boil the peels about five times to remove the bitterness. For orange peel, one boiling is usually enough. A very good recipe. I used orange peel and rolled in granulated sugar afterwards and dipped in milk chocolate. So easy and so wonderful for decorating. I sprinkled them with sugar afterwards to give them a sugary look.